How Do You Know if You’re Hiring a Sales Superstar? I often get called upon by my clients to interview potential sales representatives for their teams. It is easy to be swayed by their engaging personality, smooth style, or polished appearance. However, there are two things that I always seek. My experience has been that these two qualities are the greatest indicators of future success… and also good indicators of exceptional leadership. They come down to accountability and a willingness to learn. First, an example from politics. When the bill failed in the Senate, what if President Obama had said “I failed to do a good enough job educating the lawmakers about why this was so important and why it was a no-brainer for them to give it their full support.” By taking responsibility, it would signal that he needed to do something more. It would have been the ultimate example of the buck stopping here. Rest assured, the American people would have assigned blame to the right people (depending on your point of view). The project was wired from the start. The common thread in each of these is the lack of accountability. Of all of the interview questions, I get the most insight from the following: “Describe a big deal that you lost, and why you lost it.” The answers will either fall into the category of making excuses, or taking accountability. I look for accountability. 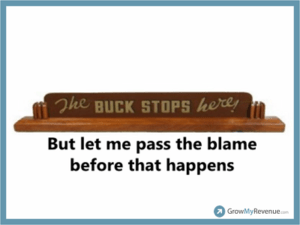 Essentially “The buck stops here.” “I got outsold,” or “They bought from his nephew, but I should have known he was in the mix” are both good examples of accepting responsibility. I look for candidates who feel there is something they could or should have done differently. This shows a sense of responsibility and an open mind that is ready to learn new things. When working with top professionals, there are two types of people in the room: A) Those who think they already know everything; and B) Those who know there is always more to learn. It is ironic that the top performing sales professionals and executives are the ones who are always open to learning new things. You might think the top performers already have the answers. In reality, they are constantly learning and taking their craft to the next level. So, the next time you are looking for a superstar sales performer, ask questions to determine their sense of accountability and willingness to take constructive feedback and learn. If so, you might have a future rainmaker in your midst. Ian, I apologize in advance for saying that you mostly got this wrong (and I’m trying to say this as nicely as I can because I generally love what you write) as the selling profession has been turned upside down since 2008. There are two things that get in the way of being able to sell in today’s world and they are NON-SUPPORTIVE BUY CYCLE and NEED FOR APPROVAL. These are major weaknesses that will neutralize your suggested strengths of a candidate who is capable of being accountable and makes no excuses. You need to find these out before you hire a sales candidate or risk another Obama-like sales hiring disaster. Karl- you are allowed to disagree. That’s what makes for a good community. People could certainty use the objective assessment tools you sell. The question I mentioned will uncover similar (though nowhere near as complete) insight about candidates. Thanks for stopping by. Matt – Thanks for chiming in. You raise some great points. Thanks for stopping by… Go Caps! Ian – I love your favorite interview question! I especially like it, because it applies to applicants for all positions, not just salespeople. For project managers or developers, you can ask “What project went wrong the most and why?” At the end of the day, we’re looking for accountability from all our folks. That’s what makes it such a powerful question. Naturally, as some of your other commenters have pointed out, there are other questions and approaches as well. However, I would include your question (and I now will) in any interview. Thanks! PS – Looking forward to seeing you in June…. David – June should be fantastic. You make a good point. I had not considered using it for other positions. I’m glad you shared your thoughts. Ian this theme came up at a client’s executive retreat I facilitated this week, as some in the room were complaining that external factors – beyond their control – were keeping the client from reaching their goals. It was somewhat true, but a very unproductive line of discussion. Fortunately things came around to more ownership and accountability fromm the organization. Whenever we blame something/someone else it doesn’t help us. It seems we could apply your lesson here to personal & geopolitical issues as well as sales. Great stuff, wise one. I agree with your premise buy don’t like your example. Had Obama started any sentence with “I failed to” he would have (wrongly I think) taken the blame for the bill’s failure. Plain and simple, the accountability for the bill’s failure belongs to everyone who placed a ‘no’ vote. They didn’t need to be ‘educated’ on anything; they were fulfilling campaign promises and promises to lobbyists to vote no. Any other scenario is a fantasy. I guess no matter how many caveats I insert, it’s tough to use a political example and not get political answers. Put another way, what if instead of John Boehner saying that the President was wrong, what if he had said “I did a poor job of illustrating to the President why this legislation was not the right thing at the right time. If I had done a better job, he would have sent a better bill to us.” The point is that by taking responsibility, others tend to be empathetic to the humility, and want to make them feel better. Neither side would have won supporters who are firmly opposed to them. But, those in the middle are often drawn in by those who accept responsibility. Ultimately, the point is that passing the buck doesn’t work in sales, or in politics. Thanks for sharing your views. I like what you add to the question. Does it work well for you?